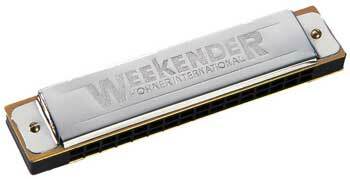 A player would be hard pressed to find another tremolo harmonica of comparable quality with the Weekender’s affordable price! Has 16 double holes with plastic body. The double row of holes on Tremolo Harmonicas creates music with a distinctive vibrating (vibrato) effect. This is produced by the bottom row of holes and the top row of holes being played at the same time and tuned to the same note, with the top row tuned just slightly higher. This special tuning enables the player to make the tremolo sound which is especially popular for ballads, gospel and folk music.